Its Saturday morning, so put “Tailgate Market” on your morning agenda. Quick…before the morning is whisked away and your opportunity to get genuinely local and delicious food has evaporated. 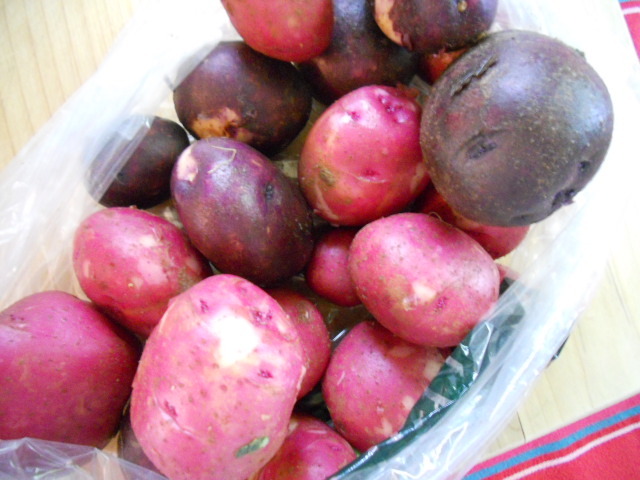 and red-skinned/white-flesh potatoes. 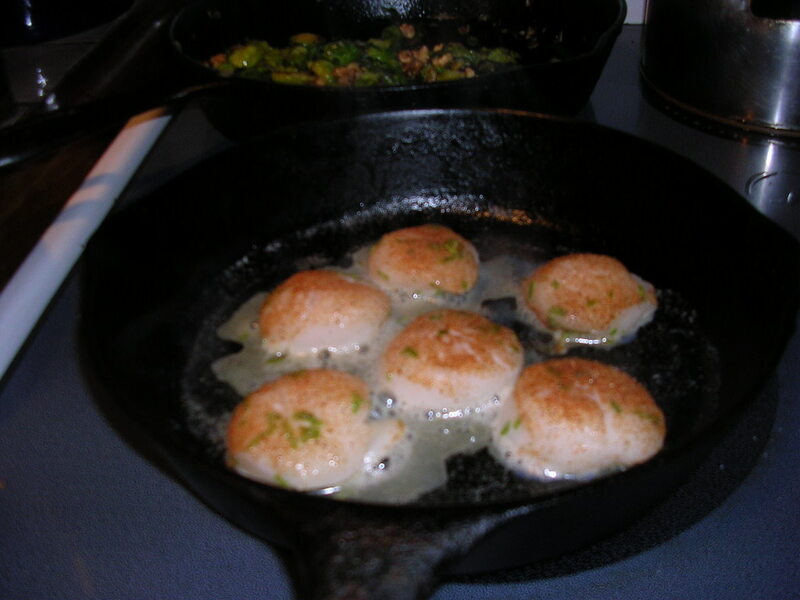 They were eaten by suppertime – tossed with olive oil, fresh basil, and a tad of salt. Simple, easy, and extraordinary. Why? They came straight from the darkness of the earth into my pot and on to my dinner plate. 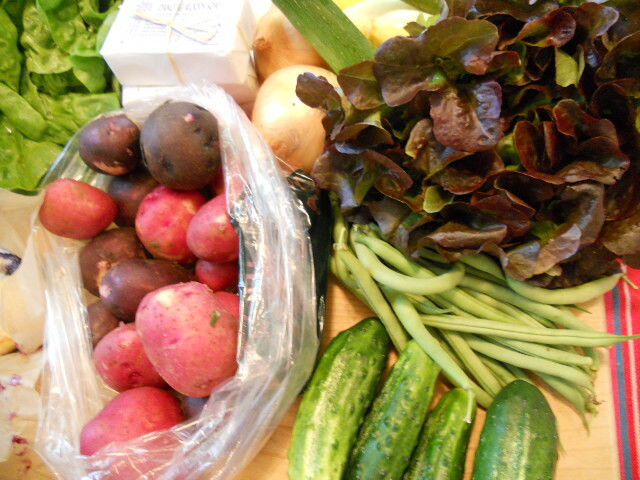 But look at all the goodies from last week’s market. This week’s bounty will be even better! Don’t Miss the 2011 Family Farm Tour this Weekend! Connect the dots ~ See the farms where your food is grown. I have been on lots of farm tours, and I have a great time every single time I go. Each farm is unique and special in some way. Most farmers give you a guided tour, and local farmers produce a variety of goods ~ veggies, meat, eggs, dairy, honey, and flowers. So check out the sort of things that interest you most. It’s a fun, educational experience that gives you & your family a chance to visit the farms you buy your food from. I know this is a bit hoakie, but see actual food growing and actual farm animals. Lots of kids have no idea food doesn’t come from the grocery store. Tickets are $25 in advance per CARLOAD of people/$30 on the day of the event. You can purchase tickets in more than 14 locations in Buncombe County, and at additional locations in out-laying counties. 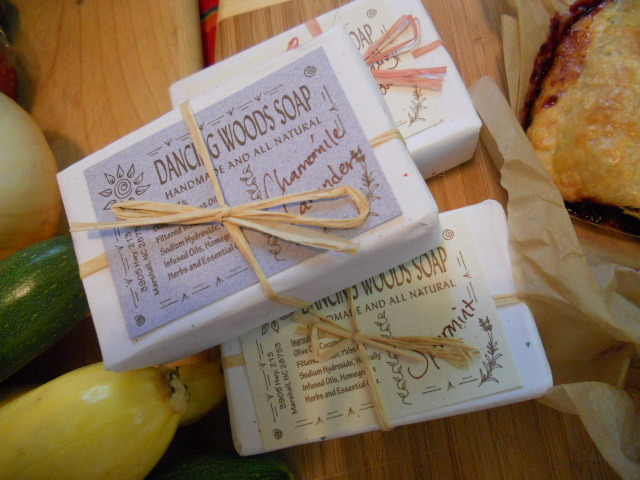 They can also be purchased at the first farm you visit. The farm tour button allows your CARLOAD to go to as many farms as you wish to during the 2-day tour. Optionally, you can simply pay $10 at each individual farm. Check out the great article in this weeks Mountain Express starting on page 46. 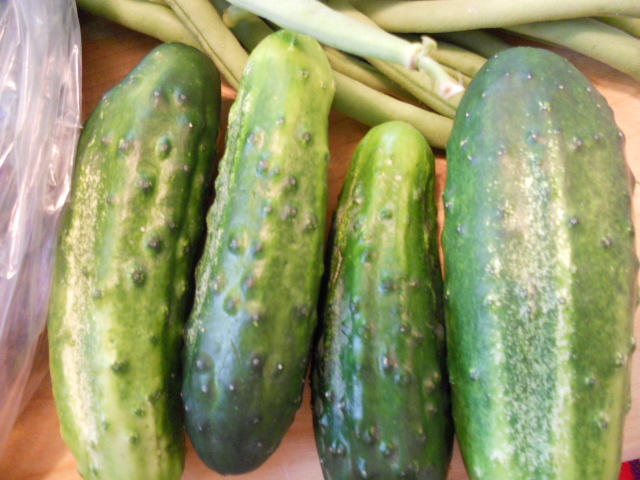 Do NOT arrive early, as most farmers have just gotten back from their Saturday Tailgate Market. Leave your house in enough time to arrive at the farm by 1:00. That will maximize the number of farms you will be able to see during the tour. Wear comfortable shoes, a hat, and some sunscreen. Bring cold water & snacks. Hit the ATM before leaving town so you have cash to buy great stuff from the farmers. No Dogs! Most farmers have their own dogs. You will be able to visit more farms if you plan an efficient route. Plan to eat at one of the farms on the tour. Stop at Wake Robin Farm for some great wood-fired pizza right out of the oven. Ivy Creek Family Farm will also be offering meals. 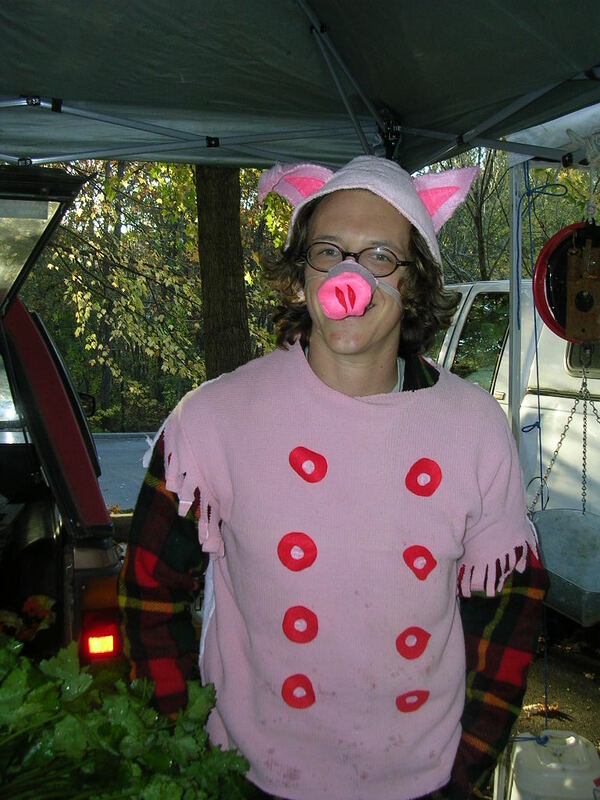 This farm is owned by Paul & Anna Littman (Paul used to manage the North Asheville Tailgate Market and their farm now sells at that market and Weaverville). Authur Morgan School will offer meals too. Unplanned and spontaneous ~ Wednesday’s dinner was mostly all-local. The Brussels sprouts that I spied in someone’s bag sent me straight to the Flying Cloud Farm stand; with my mouth watering for this unexpected treat. Ugg…there was a line. I crossed my fingers and hoped that Annie Louise would still have some Brussels sprouts left when I got to the front. She did, plus baby broccoli-shoots too. *Vegans: This is an easy vegan dinner. The potatoes, Brussels sprouts, and micro-greens salad were vegan (just substitute olive oil for the butter on the potatoes). Add some Smiling Hara Tempeh (from City Market) or Black-eyed peas if you want to add a protein source. 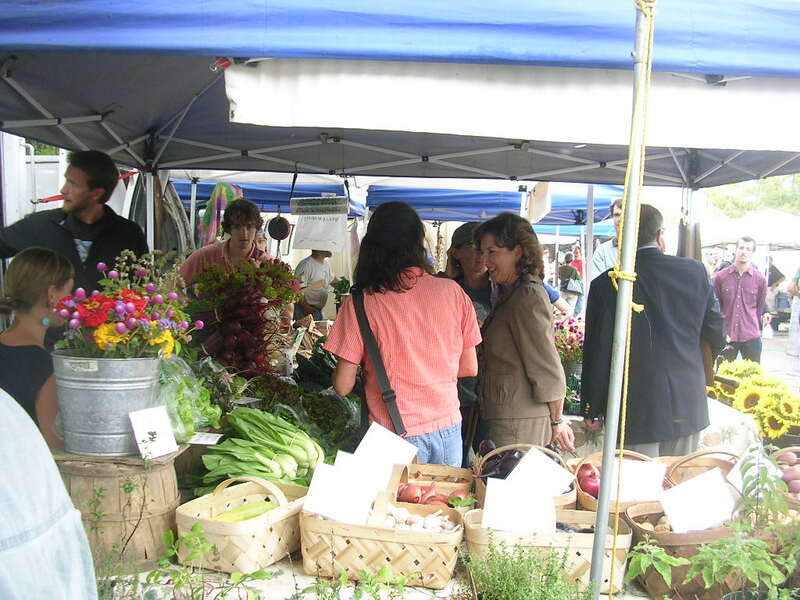 APB for Local Food Lovers…ASAP (Appalachian Sustainable Agriculture Project) recently developed two commercials that promote our wonderful area Tailgate Markets. One of the commercials has been named as a finalist in the Google and YouTube 2010 TV for All Contest. You can vote for your favorite commercial until Nov. 9. That means you need to vote right now, or at least by Monday at the very latest. The commercial in question features Annie Louise Perkinson and her daughter, of Flying Cloud Farm, AND the North Asheville Tailgate Market (of recent NY Times fame). It really is a wonderful video and it is only 30 seconds long…so just do it! Did you vote? Please vote. The other commercial is equally charming and captures the East Fork Farm girls gathering eggs, Dad with the flock, and panoramic views of East Fork Farm. 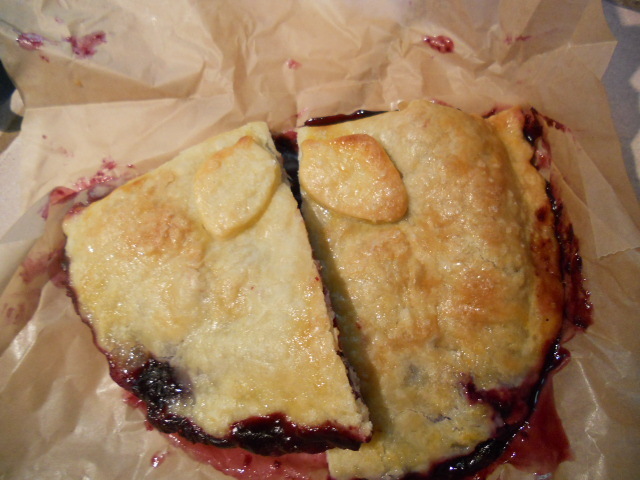 Other shots are at the Wednesday Co-op Market and the North Asheville Tailgate Market. If the Tailgate Market Video wins this contest, ASAP will be awarded $25,000 in Google TV advertising. 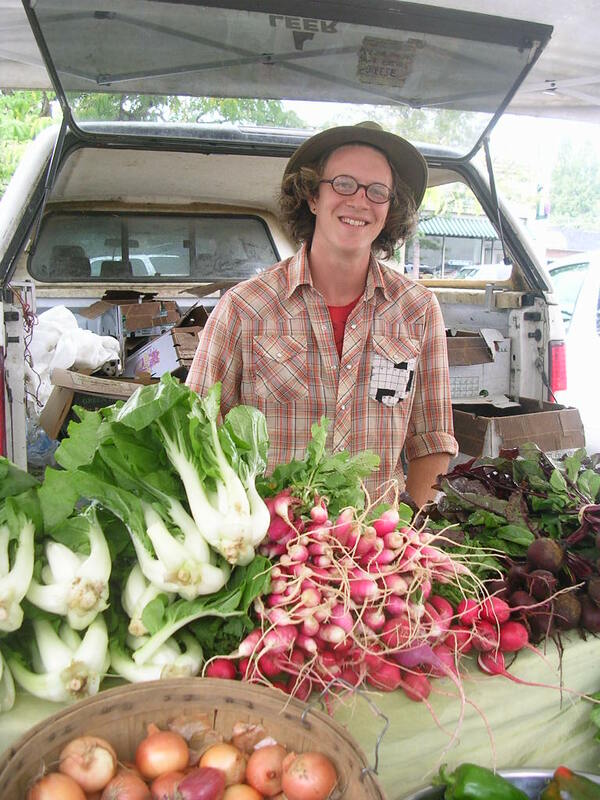 In case you don’t know, ASAP (originally Mountain Partners in Agriculture) has done tremendous things to reinvigorate local food and sustainable farming in the Southern Appalachians. Your support…watch for 30 seconds and vote…will help promote the local food we all love. The commercials were produced by Patrick Cavan Brown and feature area musicians Galen Kipar and the Galen Kipar Project. Hot! Things were cooking at the Wednesday Co-op Market this week. 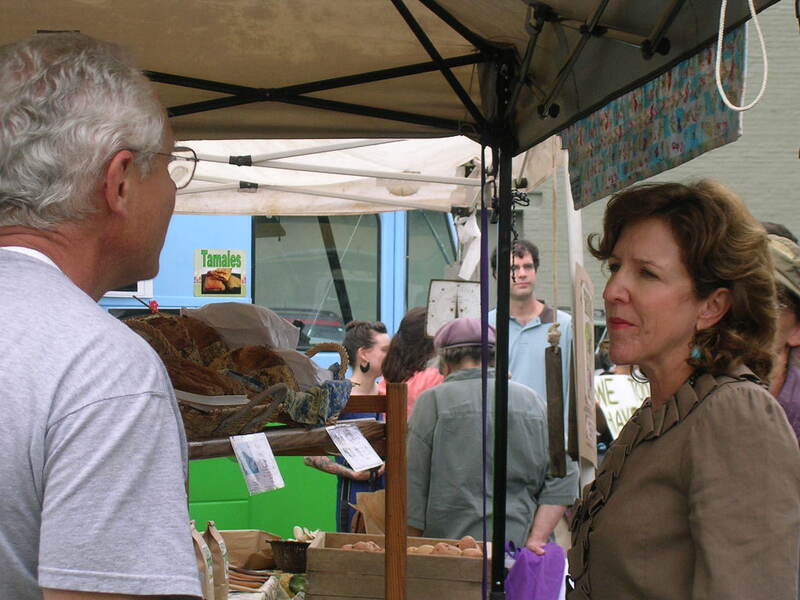 If you didn’t see the news on WLOS or read the Asheville Citizen Times, Senator Kay Hagan visited the Wednesday Co-op Market. A pack of photographers and reporters followed her around as she went to each and every stand at the market, shaking the vendors hands, conversing, and listening to the farmers concerns about Food Safety Legislation pending in Congress. Safety Bill (Senate Bill 510), an amendment that would exempt producers earning less than $500,000 a year from some of the most burdensome regulations proposed by Senate Bill 510. According to the Asheville Citizen Times article, “Owners of small farms were especially concerned about a possible $500 annual government registration fee and mandated inspections that could run $95 an hour. Some farmers said earlier this summer that the act, without the amendment’s exceptions, could cost them $5,000 to $10,000 in extra compliance expenses.” Tailgate Market Fans would be the first to realize that the small producers at our tailgate markets are not in a position to come up with $5,000 to $10,000 per year in extra expenses and still remain in the business of farming! The ACT paper quotes Nicole as saying “…it’s unrealistic to put small, independent growers on the same plane as giant food producers…Hagan’s work on the amendment is vital. Without it, it would be devastating.” The WLOS report implied that our real food safety concerns should be focused on factory farms like the ones implicated in the recent egg recall scare. Our beloved tailgate market producers are known entities with real faces, children, and farms that many of us have visited. They are not corporations! Our quality of life and our access to healthy fresh food would truly be compromised if the farmers at the tailgate markets went out of business. Regulations that make sense on factory farms do not make sense for small scale producers, and are financially unfeasible for the small farmer. It’s because they are small scale, that these farms can give us excellent food that is just one step away from a backyard garden. It is a minor miracle that we are so blessed with such an amazing selection of foods every week during the growing season. has taken some positive steps to modify the bill’s regulations for small farmers. Representative Heath Shuler has opposed House Resolution 2749. 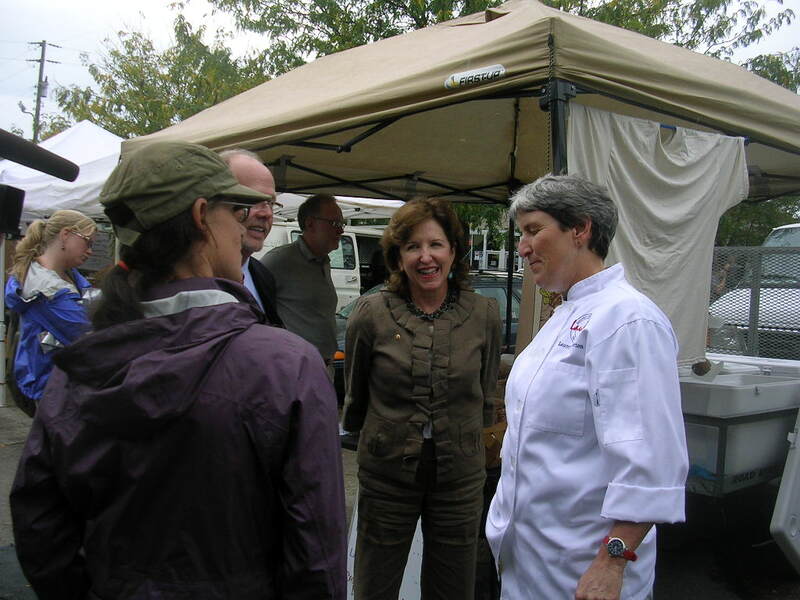 Aside from Senator Hagan, right now is a good time to thank Sen. Burr and Rep. Shuler for the steps they have taken, ask for their continued attention to the needs of small producers, and encourage their support of a sustainable local food system. Action could be taken on this bill in the next week or so. Lets make it our business to show support for our small farmers and producers by calling the Capital Switchboard at 202-224-3121 or toll-free at 877-210-5351. 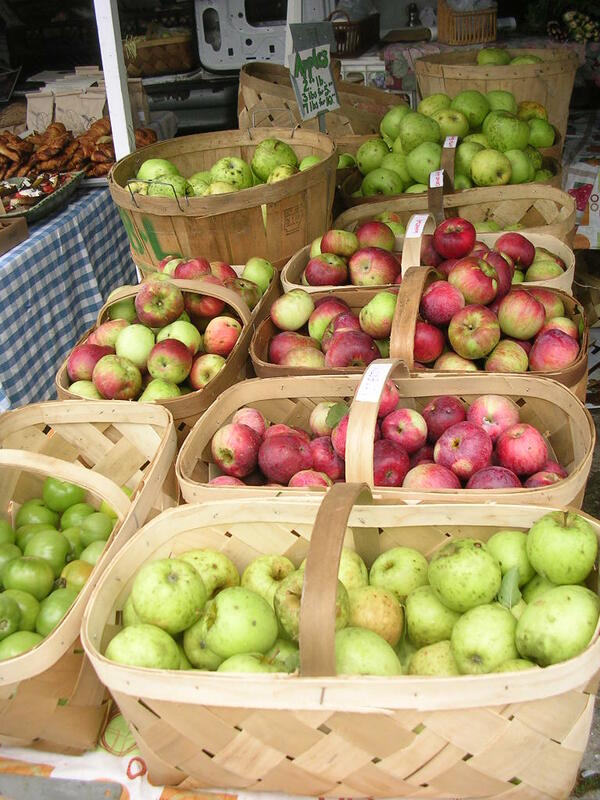 Other Market Notes: Barry had lots of different apples. Both Blue Ribbon Farm and Gaining Ground Farm have black-eyed peas. Okra. Beautiful Sunflowers. Basil for $1 a bag from Frank (subject to change?). 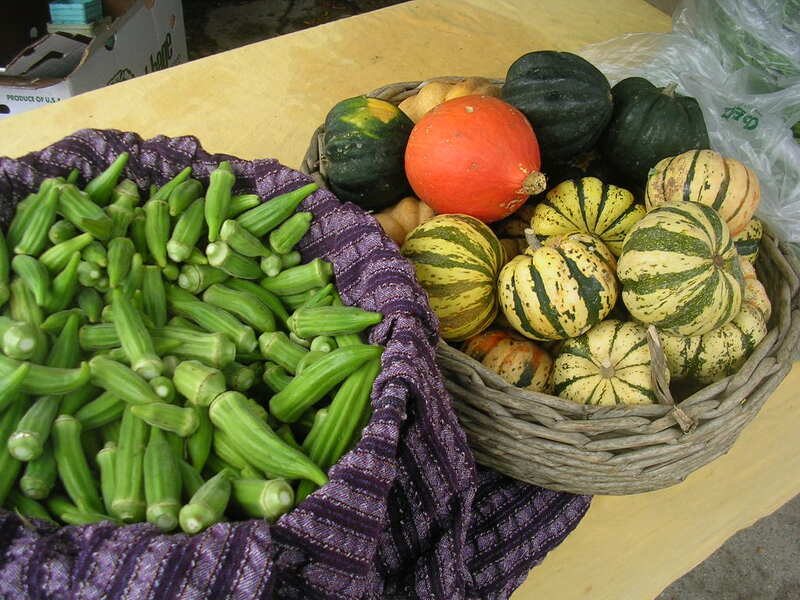 Winter and summer squash. Peppers. Tomatoes. Pears. Shiitake and Oyster mushrooms. Grits and cornmeal. Cowboy cookies. Plus tons more, and it all tastes good.